The willow trees are nearly bare this early in the year giving me full sun while the weather is cool and damp. The runoff supports the willows. The excess water has helped the willow to thrive. The dappled shade of the willow in turn, reduces evaporation in summer, keeps the temperature more moderate, and adds a rare beauty to the garden. The light dances through the leaves as the wind blows. 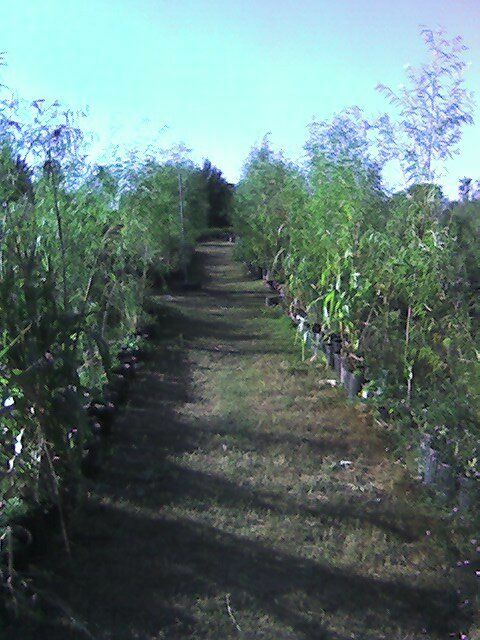 This controlled willow forest, sequesteres carbon, conserves water, and brings joy to my soul. Very nice Bob! The only shady garden I know of. Now, if you could come up with a wood product from harvesting the willows, then you would come full circle…. I must say the three potted plants I received from you are doing very well in my garden, but they did require a bit of shade…. The willow leaves are a fine source of aspirin. They don’t taste delightful, but they are fast acting headache relief. From the stems I can extract root stimulator, and I use the wood for making trellis. This particular breed likes to grow straight on a single leader, so it is quite suited to produce light weight poles. I’m glad you find them so useful! Altho, I’m not sure you can get a contract to grow leaves for aspirin, but what do I know??? And probably there will be a similar marketing problem with the poles. Now the extracted root stimulator – that might have some potential. Glad to hear about the little trees! Be sure to use plenty of pearlite or other drainage material when potting and water every day it does not rain during hot weather. The best time to re-pot is November to January tho; gives the roots time to settle in before hot weather.